TEST YOUR CAMERA TO GET TO KNOW IT’S LIMITS! 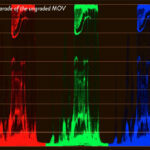 As we’ve discussed in the previous posts, every camera will have a different dynamic range. Dynamic range, like everything related to exposure is measured in stops: 1 stop more means twice the amount of exposure, 1 stop less is half of it. And it’s not only camera’s that have a given dynamic range. Displays, projectors or scanners have them, too. 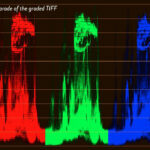 Knowing about that is important if you want to get the most out of your films. But knowing the limits of your camera is the most important of all. It is your primary tool and you must now it intimately: you have to know how it reproduces colours, skin tones, highlights, shadows, how it reacts to under- and overexposure. Part of that is testing your camera’s latitude. You need to find out how many stops your camera can reproduce so that you’d know when a scene that you’re shooting is ‘safe’ (i.e. you do not have worry about clipping) and when is it so high-contrast that you will need to be very careful about how you expose your footage. This is how you do the test. 1. You select a very high-contrast scene. 2. Using either a dedicated spotmeter or your camera in the spot metering mode you take a reading and write down the brightness of various areas of your shot. Pick the brightest and the darkest spots and find many areas in between. You’ll definitely need to measure a few dark areas because we’ll need to see, how far you can underexpose your footage to still preserve some detail in your shadows. When you’re using your camera, a very straightforward way to do this is to set your camera for aperture priority, set your ISO and your shutter speed and write down the apertures that your camera’s light meter comes up with for all these areas. In the above scene the darkest spot needed an aperture of f/ 0.7, the brightest one was f/ 45. In other words, this was a very high-contrast shot encompassing 13 stops of latitude. WHAT CAN WE DO WITH 13 STOP OF LATITUDE? If you think back what we’ve said about dynamic range you’ll immediately realise that with such a camera this scene wouldn’t be problematic at all. The latitude of the camera is greater than the dynamic range of the scene being recorded which means that nothing is going to be lost. Easy. This still was shot with a Canon 5D Mark III as a RAW file. It is obvious at first sight, that the camera does not have 13 stops of latitude: the sky is completely overexposed! Below are images taken at various apertures. Looking at the aperture that the particular image was taken at enables you to see how many stops the spot metered areas are under or above the medium grey. Just to remind you: when you meter any part of your image, the light meter will give you a reading that tells you the settings you need to reproduce that area as medium grey. If your aperture is f/ 5.6 then everything that the spotmeter reads as f/ 5.6 will be medium grey (18%). Areas that read e.g. f/ 16 are three stops (i.e. 8x) above. An f/ 1.4 spot is 4 stops under. 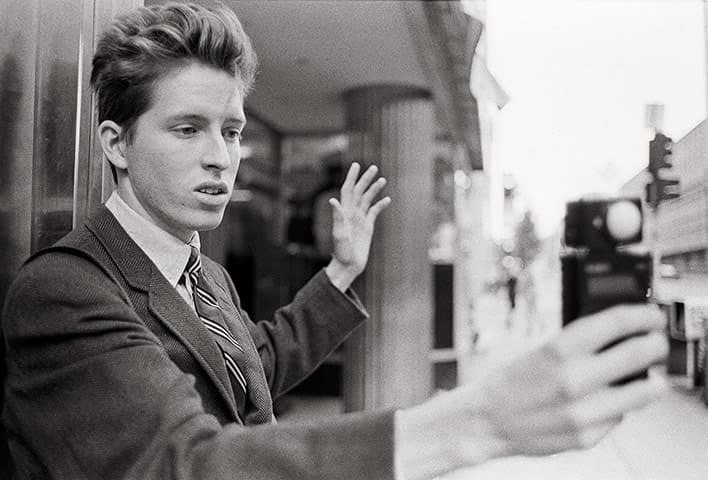 OKAY, SO WHAT APERTURE WOULD YOU CHOOSE FOR THIS SHOT? Because I do not like overexposed highlightS, I would go with the aperture that gives me a sky that still has details. Looking at the histograms, I can see that the sky is still clipping at f/ 11 but is fully-preserved at f/16. So, I would go with that shot and see what I can do with it in post. It’s very important to stress that I wouldn’t necessarily do these changes to the above image. But if I wanted to, I could without losing too much quality. As you can see from the above image, one the important facts that we have just learnt is that the sky which was 3 stops above medium grey (the still was taken at f /16, the sky was at f/ 45) was not overexposed, but 4 stop above, it was. This would from now on guide me with this particular camera. Now I know that 3 stops of overexposure is safe, 4 stops is too much. FINE. BUT WHAT ABOUT VIDEO? Well, let’s see! I shot the same scene with the same settings also as a video. I used the highest quality (All-I) settings on the 5D Mark III. Here are the results. When watching them please take into account that what you’re watching are not the original mov files. To be edited together and for the titles to be added, they were imported into and then exported from Premiere Pro. After which the movie was uploaded to Vimeo which very probably recompressed it once again. So you’re looking at a 3rd generation footage. This, however, should give you a realistic view of what will happen to the footage that you process in a similar way. Perhaps the most important conclusion is that the h.264 mov file produced by DSLR cameras (even a full frame camera, like the 5D Mark III) has a smaller dynamic range, than the RAW still file. Highlights are overexposed sooner and/or shadows get crushed really fast. This video is a comparison between the h.264 mov file and the RAW still file from the camera. First, you’ll see the ungraded versions then the graded versions. For the comparison I have used files with identical settings: ISO 100, 1/50 and f/16. There are several marked differences, not the least of which is sharpness. Even at ISO 100 (virtually no noise) the h.264 compression severely limits the amount of information contained in the file. Monitors, displays can be misleading and depending on your viewing environment you may not perceive all the highlight or shadow details in your file. 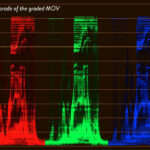 That’s why I always recommend studying the histogram, or its equivalent in video editing, the RGB parade. To understand the RGB parade just think about it as a histogram rotated 90 degrees: blacks are at the bottom and highlights are at the top. 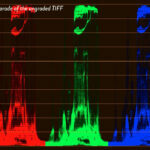 Instead of just showing luminance values, the parade shows the individual red, green and blue colour channels of images. It is fascinating to compare what grading actually does to your footage depending on how much information you had to begin with. And it is equally fascinating to see how much more information the RAW still contains at any stage compared to the highly-compressed h.264 MOV files. Comparison of the ungraded and the graded h.264 MOV footage. The parade of the graded h.264 footage shows horizontal gaps. That’s because the grading revealed that there was insufficient information in the original. Comparison of the ungraded and the graded RAW footage. The parade of both the ungraded and the graded RAW files (converted into TIFFs) is full of information. Simple proof that the ‘richer’ your original is, the more flexibility you have in post. Comparison of the ungraded h.264 MOV and the ungraded TIFF. 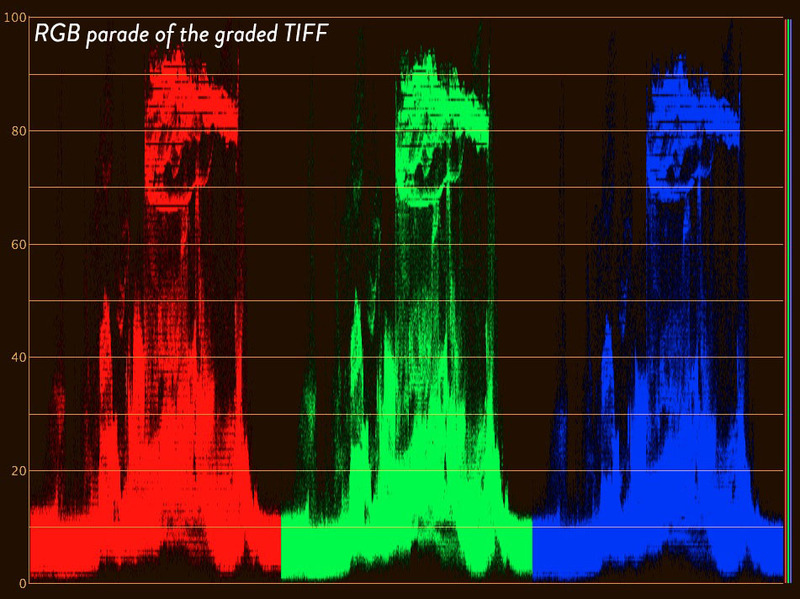 Even at the ungraded stage it’s plain to see how the TIFF has greater tonal variation an that there’s no overexposure. The highlights of the h.264 MOV are already being slightly clipped. These are the brightest parts of the sky in the scene and they will be without detail. The same is true for the shadows. There’s no clipping in the TIFF. Comparison of the graded h.264 MOV and the graded TIFF. Grading reveals the truth! 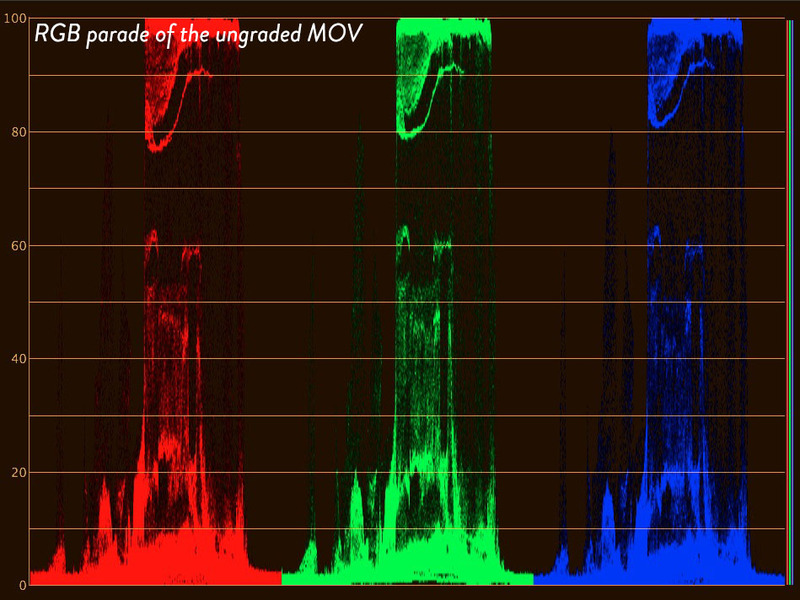 You can see horizontal gaps in both the MOV and the TIFF parades. 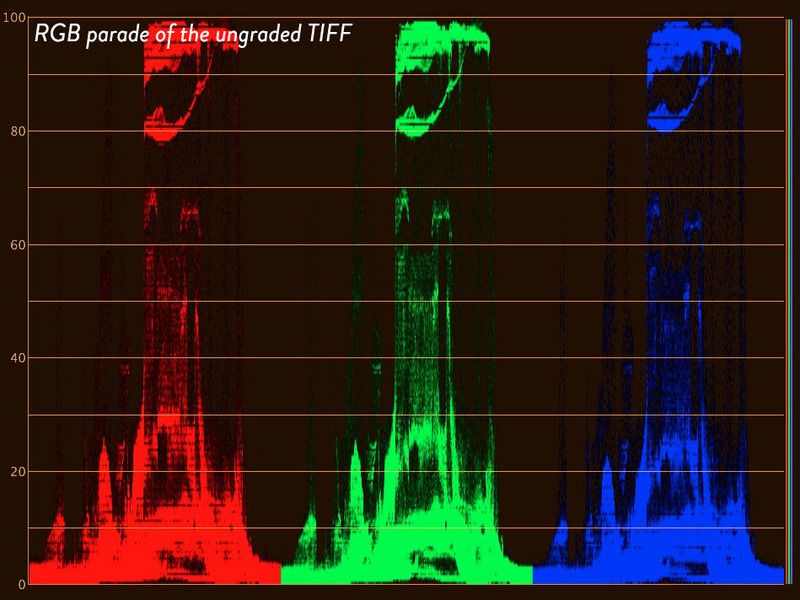 But the gaps are huge in the MOV and moderate in the TIFF file. 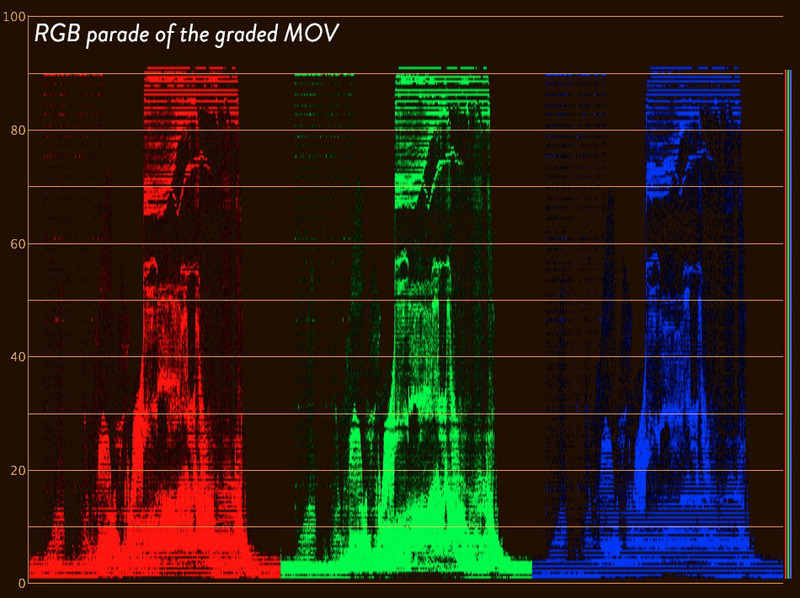 The grading also revealed all the clipping inherent in the MOV file, to top and the bottom of the MOV RGB parade are flat. The TIFF held plenty of detail that allowed for a much higher quality grade.